Horace Walpole is known mostly as the inventor of the Gothic literary novel. He was a politician, writer, and architectural innovator, as well as the youngest son of Sir Robert Walpole, leader of the Whig party, Prime Minister and Chancchellor of the Exequer. When he moved to a new home, he called it Strawberry Hill and fixed it up to resemble a gothic castle, which started an archetectural trend. He also started his own printing press there in 1757. FCIT. "Horace Walpole author page." Lit2Go ETC. Web. 21 April 2019. <https://etc.usf.edu/lit2go/authors/121/horace-walpole/>. 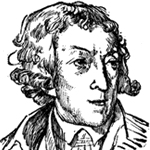 FCIT, "Horace Walpole author page." Accessed April 21, 2019. https://etc.usf.edu/lit2go/authors/121/horace-walpole/.